Formed in May 1804 by Frederick John Falkiner MP for co. Dublin 1801-1807 who was authorised to a corps of 1000 persons in Ireland. Seven months afterward with 700 persons, the King granted the title 100th Regiment of Foot and it was established in the British Army in March 1805 with Falkiner as Colonel and a Regimental establishment of one thousand men in ten companies. In 1812 the 100th Foot was granted the title H.R.H. 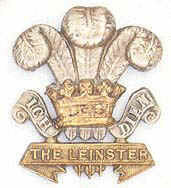 the Prince Regent's County of Dublin Regiment of Foot.